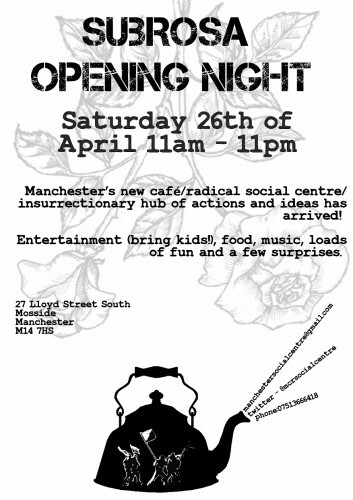 Manchester’s Social Centre Subrosa will open this Saturday at a former hair and beauty salon in Moss Side. This “new hub for activism” will be run by volunteers and offer a meeting space, a not-for-profit vegan café, computer work desks and a radical library. It will host a programme of workshops, music, art, and film events. The organisers hope that the centre will breathe new life into the local activist scene and bring together different community and political groups. The Social Centre is the work of a loosely organised group, partly active as the OKasional Café, who temporarily occupied empty and derelict buildings across the city for the last six years. The opening of Subrosa marks seven years since Manchester’s last social centre, The Basement on Lever Street in the Northern Quarter, shut due to water damage. Since then, activists and campaigners have used improvised spaces to meet, as well as the Student Union of Manchester University and Manchester’s First Centre for Sustainable Living (MERCi) in Ancoats. Work began on developing a new permanent centre in 2009, and setting up a radical community space has proved a steep learning curve for those involved. Haworth says: “There was a lack of relevant knowledge and skills within the group as none of us had done anything quite like this before.” The permanence of the project means the group have had to get to grips with music licensing, health and safety policies, accessibility issues and financial forecasting, as well as plumbing and plastering the building itself. Finding a suitable building has been hard: the group had spent several years attempting to buy, but struggled to find a large enough building in a central location which was fully accessible and affordable. With lots of ideas as to what the social centre should be like, the group found it difficult to decide which elements to compromise on. Earlier this year, key members of the group decided to rent a small and cheap venue to get the project off the ground. Haworth explains: “A few of us reached the conclusion that if we tried to be too ambitious, we could end up not having a place for many more years”. They raised money through donations, fundraisers at the OKasional Café, and events at other social centres across the UK and Europe. With the centre located in the heart of residential Moss Side, neighbours have already voiced concerns over noise, security and the use of the shared back alleyways. Haworth says: “One of our biggest challenges will be constructively engaging with the local community and existing groups in the area”. The team will set up a working group to liaise with local residents associations, they’ve decided not to apply for an alcohol licence and there won’t be any amplified music. Despite the challenges ahead, the inner city location is seen as a great opportunity for the centre to create links with neighbouring communities. Activist networks have the potential to become more visible and accessible to the general public, with a chance to break the in-the-know barrier of a generally closed leftist scene. The team has chosen the name Subrosa, Latin for ‘Under Rose’, as a reference to a practice in ancient Rome, where a rose above a doorway symbolised a secret meeting. It acknowledges that groups at the centre will be allowed to work and plan actions in confidence. Despite the secrecy implied in the name, a policy of openness and inclusion lies at the heart of the centre: the organisers have worked to ensure disabled access, and the space will be available for groups with specific requirements (such as a women-only policy) to use at prearranged times. The café will be not-for-profit, offering food and drinks at affordable and flexible prices for those who have little or no money. At an open meeting in March over 30 attendees were invited to become involved in a myriad of activities including building work, legal matters, social media and café work. The centre will be self-managed, making decisions collectively within a co-operative structure. Volunteers can become members by paying a £2 share in the co-operative, and agreeing to a set of rules of interaction based on the collective ideals of the group. The collective who have pushed Subrosa into being envision a large active membership to shape its future. 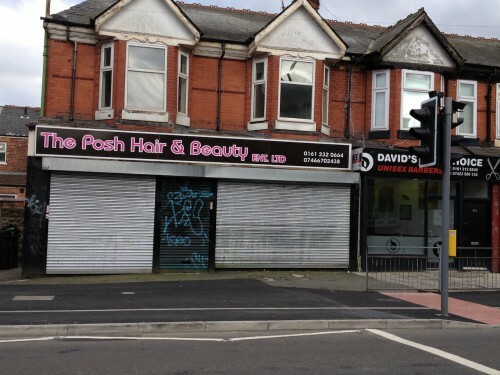 All eyes are now on the old beauty parlour on Lloyd Street South for the beginning of a new chapter for activism in Manchester. Subrosa will open at 27 Lloyd Street South, Moss Side, M14 7HS, this Saturday 26 April 2014 at 11.00am. See www.manchestersocialcentre.org.uk for more information. The centre is looking for lots of helping hands as it opens. If you’d like to volunteer, get in touch at manchestersocialcentre@gmail.com. Great to hear about a new social centre in manchester but the first OK cafe was in 1998, making it 16 years, not 6, that these social centre squats have been going on (occasionally). Congratulations on the opening- and thanks for the first day- though I’m not so purist as to feel happy without real milk in my tea and would like to see a Fairtrade wherever possible policy. I envisage future meetings. A vegan café and a radical library? Is the centre going to be run for the local community or as a trendy hobby for those who run it? I suppose these two attractions will help ensure the concern is not for profit. Congratulations on getting it back up and running, can’t believe that its seven years since the Basement was flooded! Hope it goes well, good luck with it all!